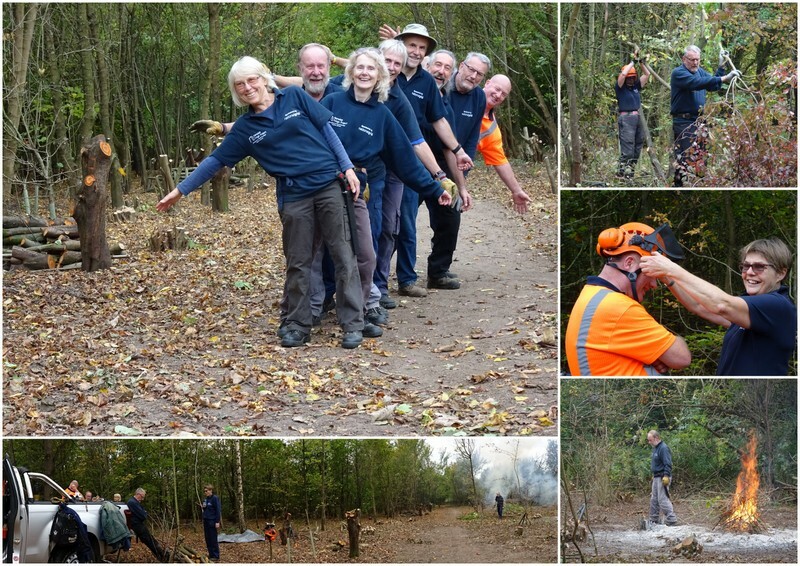 We returned to Charter Wood for a further two days of coppicing, pollarding and general tree clearance which has nicely opened up this area of the wood bringing in more light and giving more growing space for the trees. For our Thursday Group the day started a bit murky but brightened considerably. The old fire site was covered in rabbit footprints so either they had been taking advantage of the residual heat of the fire or there was something in the ash that they found appealing. We decided to keep the same fire site rather than create a new one closer to where we were working, and a fire was soon built and ready to burn the brash. On Friday the fire needed little coaxing to burst back into life. 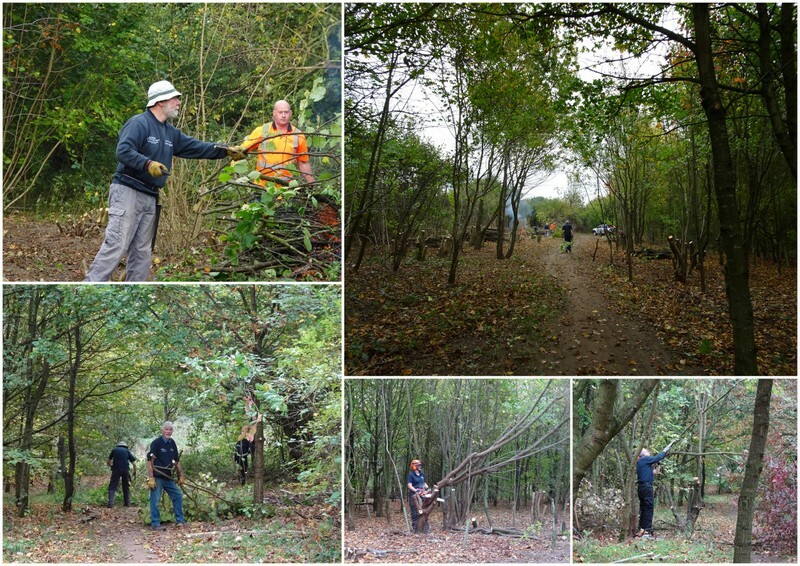 We continued coppicing our way along the path clearing a large amount of hazel during each day. Paula – Thursday, and Matt – Friday, set-to pollarding the prunus and removing some of the larger sycamore and ash trees. Everyone quickly gets in to the swing of the task – coppicing, processing and then dragging the brash to fire site where, whoever is firemaster, continuously feeds the insatiable beast. The fierce fire consumes the brash at a ferocious pace and quickly burns right down during a short stop for tea or lunch break. Our new members have settled in very well and are enjoying the experience. On Thursday Paula helped Pete adjust his hard hat which ended with everyone in fits of the giggles. Can’t remember now what was funny about but we had a good laugh. We also decided to have a team photo in front of all our hard work. This was followed up by another photo showing our lighter side (demonstrating that you’re never too old to be silly)! On Friday we were joined by Rebecca a student at Easton College who will work with us as part of her Foundation Degree. Following a tool use and safety talk we introduced Rebecca to coppicing and cutting techniques and styles. It is not just about sawing away at trees, there is a lot to learn about different types of cut and making an assessment of the tree and where it might fall, and who might be in danger, before starting any work. Matt also took time to explain to newer team members the management plan for Charter Wood, which is to create an age structure through rotational coppicing and pollarding. Understanding the reasoning behind our work is essential since that enables us to make the right decisions about what to cut and how. So that’s it for Charter Wood for a few weeks. We will be back later to do a bit more in this section and then again around April to put tree guards around the coppiced hazel stools. It is a nice and peaceful area of woodland in which to work. There is a regular flow of dog walkers throughout the day and many stop to chat. 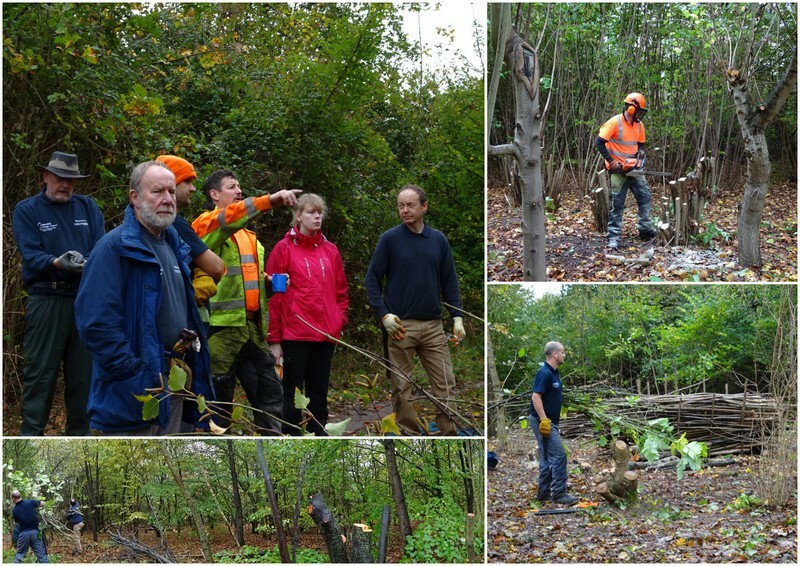 It is good to hear their compliments about our work and how it improves the look of the woodland. Like many of our sites Charter Wood sits on the edge of large areas of residential housing and provides a green space for the locals to walk. Getting the right balance of access and conservation is something the Fringe Project works hard at.